Disused market building in Luen Wo Hui, originally run by Puntis. New buildings in Luen Wo Hui. 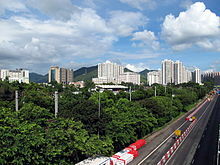 Fanling (Chinese: 粉嶺; Cantonese pronunciation: [fɐn˨˥ lɛːŋ˨˧]), also known as Fan Ling and Fan Leng, is an area in the New Territories East of Hong Kong. Administratively, it is part of the North District. 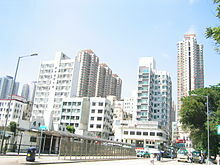 Fanling Town, part of the Fanling area, is where most of population of the area live. Part of Fanling-Sheung Shui New Town, Fanling Town includes Luen Wo Hui (聯和墟), the marketplace of Fanling before urban development in the area, and Wo Hop Shek (和合石), where an uphill public cemetery is located. The population of Fanling keeps growing. Today many public and private estates can be found in the area. Northwest of Fanling is Sheung Shui and southeast is Tai Po. The name Fanling is a shortened form of Fan Pik Leng (粉壁嶺). The enclosing walls and corner watch towers of Kun Lung Wai, Lung Yeuk Tau, is a declared monument of Hong Kong. Fanling North is one of three new development areas currently being planned for North District, in parallel with Ta Kwu Ling and Kwu Tung North. Fanling Wai (粉嶺圍), a walled village. Fung Ying Seen Koon (蓬瀛仙館), a Taoist temple. Siu Hang Tsuen (小坑村), an ancient village. Wikimedia Commons has media related to Fanling. This page was last edited on 19 March 2019, at 13:12 (UTC).